There are several different types of lasers. 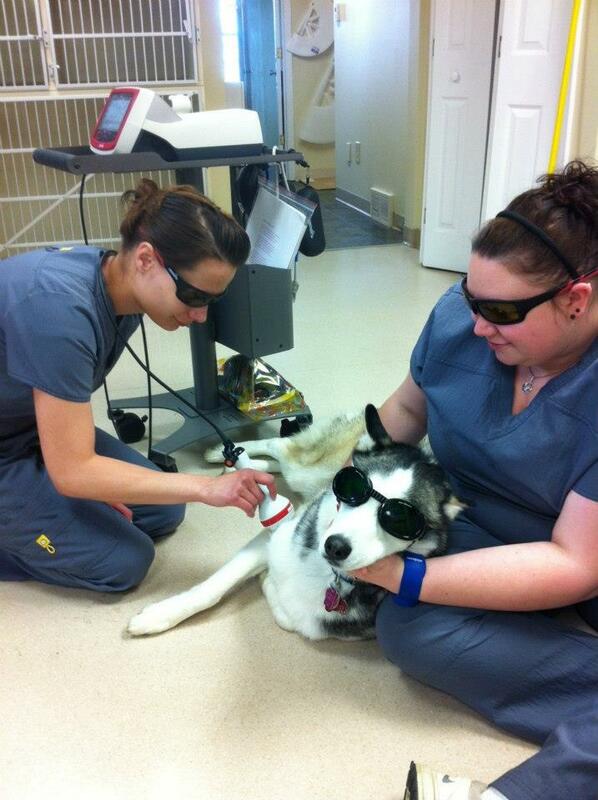 Hometown Veterinary Hospital has a Class IV laser. This type of laser therapy uses an intense beam of light directed into tissues to reduce pain, reduce inflammation, and accelerate healing. Laser therapy can be used alone for pain management or as an additional method of pain management along with medication. The addition of laser therapy often allows for the dose of pain medications to be lowered over time. The laser acts on nerve cells and pain receptors. It reduces the activity of the pain receptors and increases the release of endorphins which results in a decrease in pain perception. The laser also reduces edema through dilation of lymphatic vessels and decreases the release of prostaglandins by increasing the activity of certain white blood cells. These effects combine to decrease inflammation. It accelerates healing by increasing blood flow to the area. It does this by dilating vessels in the area and promoting angiogenesis, or growth of new vessels. It also stimulates fibroblast activity and collagen production to help rebuild tissue. What conditions can be treated with a class IV laser therapy? Chronic conditions – These conditions require initial treatment extending over several weeks and are often followed by on-going treatments to maintain effect. A few examples include; elbow hygromas, neuropathies, degenerative joint disease, inflammatory bowel disease, periodontal disease, lick granulomas, geriatric care, hip dysplasia, feline acne, tendonitis, osteoarthritis, and otitis. What is a typical laser therapy session like? A laser therapy session for a wound or acute injury often takes 5 minutes or less while a session for chronic arthritis involving multiple sites can take up to 30 minutes. The treatment is typically done in a room with the owner present. Everyone present, including your pet, will be required to wear protective eyewear. A hand piece is used in a scanning motion over the affected tissue. Most patients tolerate treatment very well, experiencing a gentle and pleasant warming sensation in the tissue. Most patients relax as treatment is administered. Are there any safety concerns with the laser or conditions that should not be treated? Eye protection is critical when using a Class IV laser. Everyone in the treatment area should wear appropriate safety glasses and pay attention to avoiding direct exposure of the laer to the patient’s eyes. There is limited research on which conditions should not be treated with a Class IV laser. At this time malignancy (cancer), thymus and thyroid glands, reproductive glands, pregnancies, ocular lesions, and areas with active hemorrhage are contraindicated. Treatment after administration of photosensitizing medications is a definitive contraindication.